Car Cosmetics is the mobile shop to call for all of your car body repairs in Wakefield. 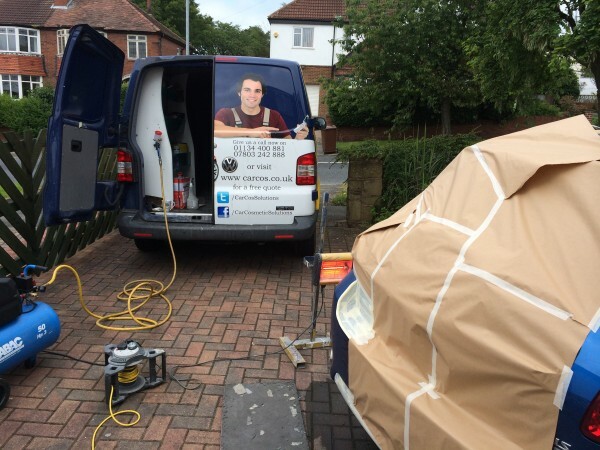 We’ve been serving Wakefield and surrounding areas for many years and have a lot of very happy customers. We know that getting into an accident can be a frustrating time; we’re here to make your car look just as good as it did before the unfortunate event. We have an entire fleet of highly trained car body repair experts in Wakefield waiting for your call. We also make it extremely convenient for you to have your vehicle worked on by offering most of our services at your home or office, 7 days a week. We know it can be a huge inconvenience for you to have to bring your vehicle in to a garage and wait around all day while your car is worked on. Even if you get a ride back home, you still have to arrange transportation and so on to get your vehicle fixed, which is why we decided to offer our mobile shops for repairs at your home or office! No matter what the issue is, our team of experts can perform all types of car body repairs in Wakefield on-site or at our garage. If you’re looking for a specific type of repair, visit our services page to learn about our services and find out more about what exactly we offer. As one of the top providers of car body repairs in Wakefield, we strive to obtain complete customer satisfaction throughout the entire process. We know it’s stressful to have your car damaged and having to pay to get it fixed up probably isn’t what you were looking forward to spending your next paycheck on. We’ll take care of it with the highest level of quality available at a great rate, too. Paintless Dent Removal – by using a mixture of trade tools and techniques, we’re able to effectively massage dents out of most of the car panels in your car – doors, bonnets, roofs, etc. Our methods are completely safe for your paint and clear coat, saving you time and money. Plastic Bumper Repairs – bumpers are designed to absorb impact, and are one of the more common areas for car body repairs. Whether you have a chip, crack, or dent in the bumper, we have over 15 years of experience with plastic bumper repairs throughout Wakefield and surrounding areas. Rust Repairs – rust can spread underneath your paint and cause significant damage to the paint as it moves around the metallic parts of your vehicle. By taking care of the rust damage before it has the chance to spread, you could be saving yourself a lot of time and money. We’ll clean up all rust damage and re-seal the area to prevent further problems. Wing Mirror Repairs – since your wing mirrors stick out so much from your vehicle it’s not uncommon for them to get clipped on a garage or a pole at the petrol station. While it may look ugly to have your mirror scratched, dented or broken, just know that Car Cosmetics can fix your wing mirrors – hassle free! We stand out from the competition by offering only the highest quality wing mirror repairs in Wakefield – all at our competitive pricing. Car Cosmetics is proud to employ only the most qualified and experienced auto body repair specialists around. We pride ourselves in the work we do, and you’ll certainly be satisfied with the job. No matter what kind of car repair you require, know that Car Cosmetics is standing by to get your vehicle repaired and looking good-as-new. For a full list of services we provide, make sure and check us out or give us a call on our freephone number 0808 123 4808. We look forward to being your go-to choice for all things car body repairs in Wakefield! Fill out the form below for any type of car body repairs in Wakefield.